If your job is making fun interactive things for children, your website should probably reflect that. 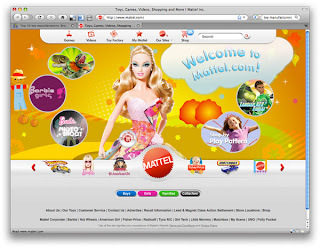 First up in exploring the Toy industry is Mattel. 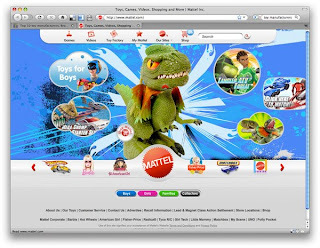 While not pushing any boundaries, the Mattel site does feel a bit like a kids toy. All the buttons and motion have sound effects that you usually find accompanied by furry animals or big plastic instruments. Interesting note on the masthead, you can click at the top or bottom to have all the info/images (ie. dino, and cloud images seen above) move in and out via a Z-index, revealing completely new toy environments. Unsurprisingly, the site has a whole section dedicated to games. I didn't see anything that struck me as topic worthy, but I will say that all the games were centered around Mattel products, and, for the most part, well executed. I say this because you can find some real crap when it comes to advergaming. We've seen this before, many times. Basically a build-your-own-scene application. Choose backgrounds, toys, accessories etc. The interface is one of the better I've seen however and worth a look. The page features a wind-up randomizer device, which when used, just throws a bunch of objects into a scene. Strange results, but the device is fun to use. Best feature of this app is that it begins building a Wish List below with all the toys you pick for your scene. 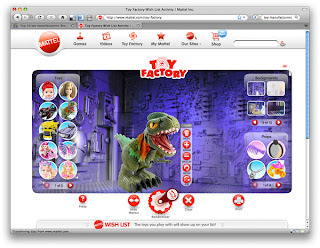 The Mattel site is pretty cool.